Politics in France are tense. The right wing Raffarin government scored a victory in the summer by forcing through pension reforms. With the budget deep in the red, they are keen to push ahead with their neoliberal progamme. But after just 18 months in office they have become deeply unpopular. Rising unemployment is causing widespread resentment and the death of 10,000 people in the summer heatwave caused a huge scandal about the state of the health and social services. But Raffarin's big problem is popular resistance. The government may have headed off the spring strikes against pension and education reforms, but the strikes involved more workers than the great public sector revolt of 1995. At the same time the protests at the G8 summit in Evian drew tens of thousands of activists from across France and the huge gathering of the movement at Larzac in August exceeded everyone's expectations. As many as 300,000 travelled to the small southern town of Larzac to welcome the early release of anti-capitalist activist José Bové from prison. This was spectacular proof of the strength and radicalism of the French movement. The large number of trade unionists present showed many workers are still up for a fight. This standoff is the backdrop to debates in the French movement which are bound to continue through the European Social Forum (ESF), and which have a resonance for the movement across the continent. Coming so soon after the record-breaking global anti-war demonstrations and the huge French protests against neoliberalism this assessment seems perverse. Cassen and co are flying in the face of all the available evidence when they argue the war is a 'single issue'. The Project for a New American Century is exactly about military back-up for US corporate dominance. The fact that people recognise this tie-up is one of the reasons why there is so much opposition to the war. It is why the word imperialism has come back into popular usage. Many of the first great mobilisations of the movement--the 300,000 who marched in Barcelona last March or the million who marched in Florence at last year's ESF--have been explicitly against neoliberalism and war. The drive to war has caused so much anger because it is the most extreme expression of our rulers' willingness to put the profits of the multinationals before the lives of ordinary people. And there's a lot of evidence that the anti-war movement was actually a springboard for action against neoliberal programmes. Activists from Attac Germany have pointed out that many of the young people first onto the streets against Schröder's social reforms in the spring joined the movement over the war. Campaigners at Cancun insist the revolt against the WTO couldn't have happened without the inspiration of 15 February. The anti-war movement didn't stop the attack on Iraq, but it did enough to damage the warmongers. This needs underlining because there is a pessimism in parts of the movement that can lend credibility to the Cassen/Nikonoff argument. The Blair government has been reeling ever since the big demonstrations--polls show now that a majority in Britain are against the war and want Blair out. In the US Bush's ratings are tumbling and the occupation of Iraq is such a disaster he has had to sideline chief hawk Donald Rumsfeld. Meanwhile the anti-capitalist movement still has mass support. A recent poll conducted in 25 countries by the World Economic Foundation discovered that in all of them a majority support demonstrations against corporate globalisation as long as they are peaceful. We need serious debate at the ESF in Paris. It is precisely the fact that the movement has grown and that it's threatening the neoliberals' grip on events which means there are some very big questions to address. The first has got to be, how do we break through the current logjam? There have been national strikes against neoliberal attacks or the war in Germany, France, Greece, Spain and Italy. 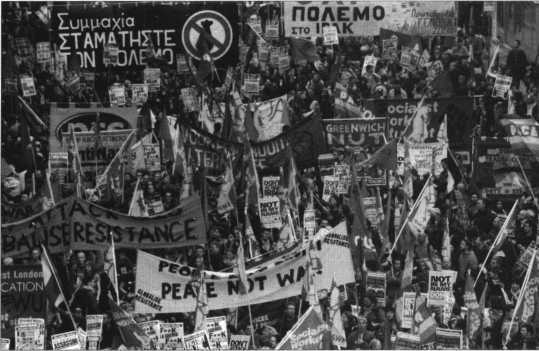 In Britain we have seen the unprecedented involvement of the unions in the anti-war mobilisations. These mobilisations have shaken governments and given huge numbers of people the confidence to challenge the prevailing logic of the market. Striking French teachers proved they were part of the anti-capitalist movement when they demonstrated with banners saying 'We don't want your kind of reforms--we don't want to live in your kind of world'. The Paris ESF has broad trade union backing and there is a serious move to try to call a 'Social 15 February' from Paris, a Europe-wide day of action against the neoliberal programme being pushed by the EU and its member governments. Whether or not that takes off, Paris will be a chance to argue the need to take our radical ideas into the working class movement. There is nothing inevitable about this. 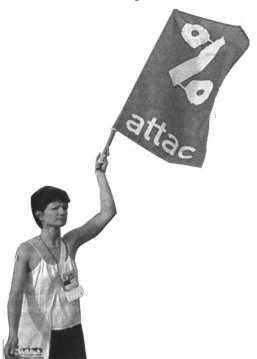 The autonomist politics which influence sections of the movement are an obstruction to involving workers. Last month 250,000 mainly trade union activists marched in Rome against the proposed EU constitution. At the same time the social movements organised a separate demonstration of 50,000 in the south of Rome. Billed as more militant, in reality it featured a stage-managed encounter with the police, and meant that on the day the movement was divided. Another key job for the ESF is to propose alternatives. There is a danger a gap can open up between the spirit and dynamism of the movement on the ground and the political thinking that dominates the formal structures. The revitalised social democracy proposed by the Cassenites is hardly likely to inspire. In fact it is hardly likely to materialise at all as we are told any rapprochement with the social democrats depends on us turning our backs on radicalism. Meanwhile the autonomists avoid developing any political or social vision in deference to the spontaneity of the movement. If we don't start to develop an alternative politics with real credibility we will leave the field open to various versions of the Third Way on one hand and the far right on the other, and our failure will become a drag on the movement itself. The explosion of the movement onto the streets earlier this year and the very public counter-offensive from some in the Attac leadership has created real ferment in the French movement. Many key figures are protesting against the divisive and defeatist arguments of Cassen and Nikonoff. Socialists have an important role to play in helping to map a way forward for the movement at a critical moment.